Mystery, Suspense, Surprise: terms more often associated with Alfred Hitchcock films than haute horlogerie . . . until now. Until the beguiling Chapter Three Reveal by Maîtres du Temps. The perfect watch for the well-heeled globetrotter might feature the following: time, date, moon phase, and a second time zone and day/night indicator—to avoid calling home at 3 a.m. instead of 3 p.m. However, while all of these indications are useful, they are not all necessary all the time. Indication-rich timepieces have always been a compromise between functionality and refinement—an uncluttered dial is a more elegant dial. Or, to be more precise, indication-rich timepieces have always been a compromise between functionality and refinement . . . until Chapter Three Reveal. Independent Master Watchmakers Kari Voutilainen and Andreas Strehler have created a stunningly elegant timepiece that displays hours, minutes, seconds, date, and phase of the moon, all set on a sumptuous blue guilloche dial. But that’s not all, and this is where Mystery, Suspense and Surprise come in: Voutilainen and Strehler have also kept a couple of intimate secrets in reserve, to be revealed, and perhaps even shared, at the owner’s pleasure. A pusher set into the crown lowers two invisible panels in the dial to reveal two more hitherto hidden indications: a second time zone indicator (also known as a GMT) and a day/night indicator, both displayed on Maîtres du Temps’ signature rollers. Elegant sophistication has never looked so good. Solid 18K gold hands and large Roman numeral hour indices are exquisitely and legibly juxtaposed against the majestic blue dial, which is finely engraved with a radiating sunray pattern. With the secret panels closed, the central hours and minutes are complemented on the dial by a small seconds sub-dial at 8 o’clock that is esthetically balanced by the date sub-dial at 2 o’clock and a moon phase indicator at 4 o’clock. Both the small seconds and date sub-dials are subtly distinguished from the main dial by Clous de Paris guilloche and are clearly marked with neat little nameplates. The earth’s shadow passes over a photo-realistic moon to indicate its phase. Opening the invisible panels reveals the day/night indicator at 12 o’clock and the second time zone indicator at 6 o’clock. The day/night roller rotates in 24 hours and features engraved, polished, printed, and hand-painted icons: the sun to symbolize day and the night sky to represent night. This indication is of particular benefit when using the second time zone, which is why it is revealed at the same time, as it enables the user to keep track of the hour at home and to know at a glance if it is day or night there. To maximize legibility, the second time zone at the bottom of the dial is displayed on two separate rollers: hours 1–6 on one and 7–12 on the other. When transitioning (forwards or backwards) between 6 and 7 or 12 and 1, the superseded roller slides horizontally out of the way and the new roller moves into place. This innovative mechanism has been awarded a patent. Using two rollers instead of one means that only six numbers have to be displayed around the circumference of each roller, enabling them to be twice as large, so twice as easy to read. The Chapter Three Reveal movement, developed by Kari Voutilainen with refinements and technical solutions by Andreas Strehler, is both Maîtres du Temps’ first completely in-house movement and the first movement Voutilainen has developed for a brand other than his own. Voutilainen also specified and is responsible for the high-level finishing of the movement. To incorporate so many indications and mechanisms in such a slim, elegant case necessitated more than three years of collaborative work. Developing the movement from scratch enabled the rollers to be integrated to the caliber rather than added as a more space-consuming module. High-efficiency conical gearing—a Strehler specialty—contributes to both the efficacy of the power distribution and reliability of the mechanisms. 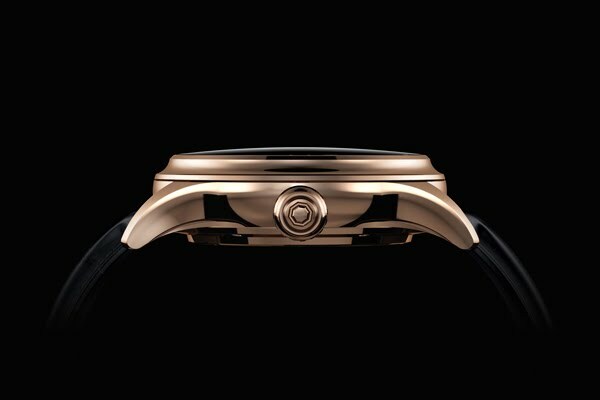 The bespoke movement architecture also incorporates the mechanism for opening and closing the reveal panels in the dial. Building this functionality into the movement rather than adding to the complexity of the case maximizes both reliability and use of space. The panel open/close mechanism is a movement complication in itself. With the dial closed, pushing the button in the crown lowers the panels below the dial, and releasing the button causes them to rotate out of view so that the second time zone and day/night rollers are revealed. Pushing the button again rotates the panels into position and, releasing the button causes them to elevate and sit flush with the dial. As might be expected from two of the world’s best watchmakers, rich functionality and stylish good looks were not enough: a superlative watch should also be an accurate timekeeper. To that end, the movement is regulated by a Straumann escapement, featuring a lightweight energy-efficient escape lever and balance spring with an isochronism-improving Breguet overcoil. 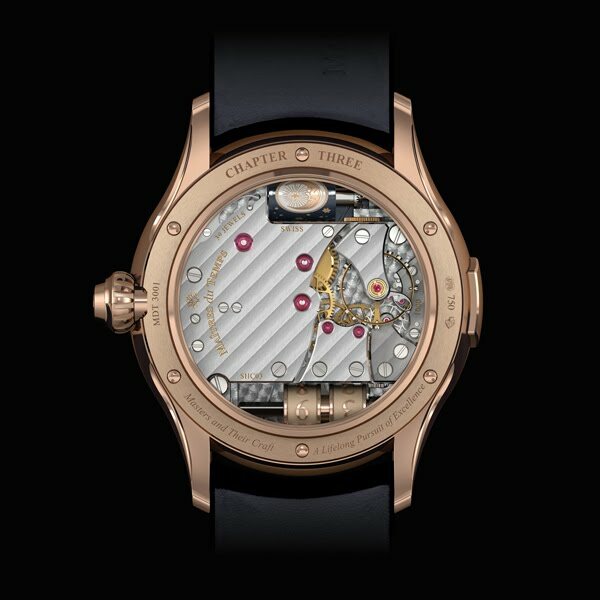 With Chapter Three ‘Reveal’ by Kari Voutilainen and Andreas Strehler for Maîtres du Temps, when it comes to choosing between functionality and style. . .you don’t have to. Widely renowned for his superlative fine finishing, Kari Voutilainen took his first steps to becoming one of the most innovative and influential independents of our time in the early 1980s, when he qualified as a watchmaker at the respected Tapiola watchmaking school in his native Finland. Work as a repairer and restorer of antique timepieces followed before he came to Switzerland in 1989 to complete the WOSTEP Complication course. His talent was quickly recognized by Michel Parmigiani, and Voutilainen spent nearly 10 years restoring some of the world’s rarest timepieces and creating bespoke pieces for Parmigiani. 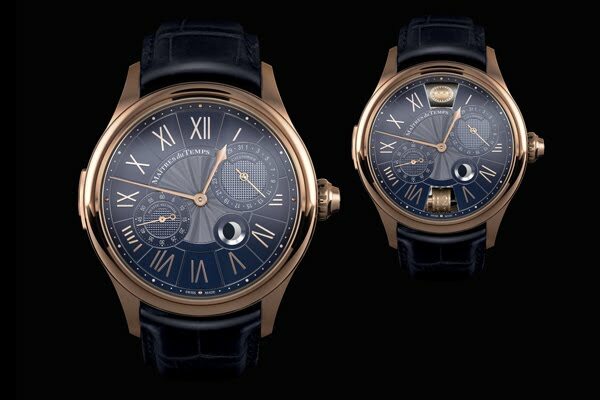 Voutilainen then headed WOSTEP’s department of complicated watchmaking before setting up as an independent in 2002, when he created, among others, a collection of decimal repeaters and Observatoire timepieces, for which he was awarded the 2007 Grand Prix de Gèneve award for Best Men's Watch and his new Vingt-8, featuring his completely in-house movement. The complex proprietary movement for Maîtres du Temps’ Chapter Three Reveal is the first caliber Voutilainen has developed for another brand. 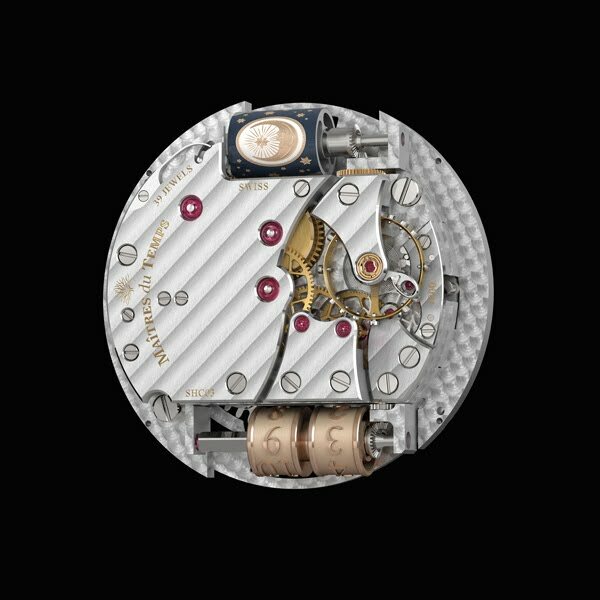 Kari Voutilainen developed the complete movement architecture, including the gear train and complications, designed the bridges and plates, specified the decoration, and is responsible for the high-grade finishing of the movement. Ingenious constructor Andreas Strehler is widely respected for his work as an independent master watchmaker—his own watches include the Papillon and the Opus 7 (for Harry Winston)—and as a consultant and watchmaker for prestigious brands. After completing a watchmaker apprenticeship in Frauenfeld, Switzerland, and attending the Watchmaking School of Solothurn, Strehler worked for Renaud & Papi as chief prototypist for four years. In 1995, he became an independent and worked on restoring antique timepieces before presenting his first creation at Baselworld in 1998: a perpetual desk calendar. 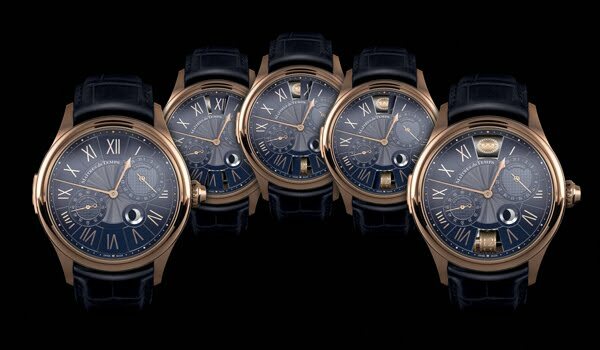 In 2001, Strehler made history as the youngest watchmaker accepted as a member of the Académie Horlogère des Créateurs Indépendants (AHCI), while in 2006; Strehler’s Moser Perpetual 1 won the complicated watch prize at the Grand Prix de Genève. Strehler has developed, inter alia, a brilliant switching mechanism that enables indicators to signal different functions, according to his philosophy of using complexity to provide simplicity (for the user). Not only does Strehler develop the movements for his innovative mechanisms, but he also creates many of the machines and software required for their manufacture. He has so far created as many as 30 movements and complication modules, 11 of which have been awarded patents. For the Chapter Three Reveal, Strehler developed the technical interface between movement, complication and case, in addition to devising innovative production methods and technical solutions.